Welcome to Reyland's of Seavington we are Mercedes Specialist's. ONLY 2 OWNERS FROM NEW + JANUARY 15th 2020 MOT + 12 MONTHS AA BREAKDOWN COVER + SERVICE HISTORY + 3 MONTHS NATIONWIDE MECHANICAL BREAKDOWN WARRANTY+ EXPERIAN HPI CHECKED + FULLY DETAILED INSIDE AND OUT. This Mercedes SLK was recently taken in part exchange against a newer Mercedes from us. 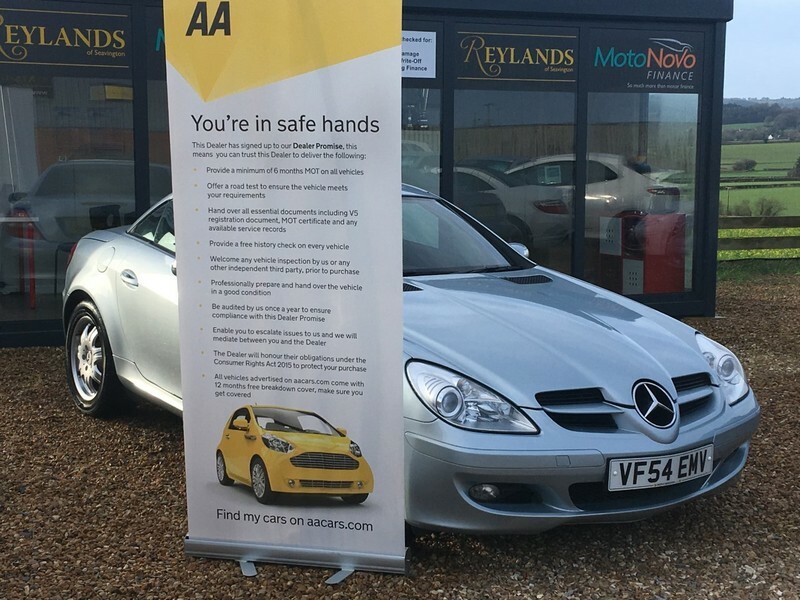 This SLK is in good condition and is super value for money at this price, this particular SLK has a Rare 6 speed manual gearbox, black leather seats, cruise/limiter, air conditioning, SAT NAV, electric mirrors, electric windows, auto lights, black leather steering wheel and remote locking with x2 keys. This SLK looks and drives well and early viewing is recommended at this price.